Doodle Jump APK 3.9.4 is simple and charming; enough said. This is a classic arcade game and you will instantly fall in love with this game. Being a simple game of jumping, flying, and reaching the sky, it has won the heart of many people ever since its inception. For a simple platform arcade game, simplicity is all it offers to you. But this very simplicity is also the reason why this game is so addictive, despite its simple gameplay of jumping from platform to another and reaching the highest side. How else can this game entice you even further? The main objective in this game is to operate a jumping being in a form of a scribble to move and jump as high as you can. Being a platform game, your goal is to aim for the highest score yet. But, as you jump your way to the higher ground, tons of traps such as black holes, bad creatures and unstable platforms will get in your way. Luckily, this little scribble of yours is armed with cannon to eradicate many enemies and traps. 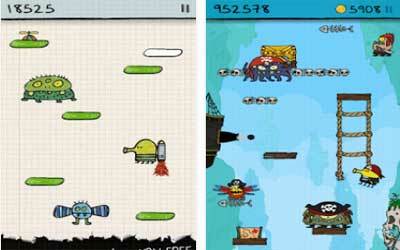 Even with the additional cannon feature, Doodle Jump retains its simple controls as a platform-based arcade game. By graphics, it has a very distinctive visual art. The design was developed with a hand-drawn style which makes this game very adorable. The characters are also visualized as some hand-drawn creatures, making them very distinct. Furthermore, this very different visual style will definitely add more fun to the gameplay, as you focus your way on the gameplay. Finally, different world skins as you jump higher also give Doodle Jump separate feel, unlike the other casual games. In short, Doodle Jump for Android is an adorable, simple game that will definitely make you fall in love once again. A few tweaks and bug fixes. Share your scores with your friends!